I put two workouts together to make a really good format. First a tag team workout followed by a leap frog workout. Partner 1 (P1) starts on pullups while P2 runs 400. P1 does as many as possible until P2 comes back from the run and tags P1. Then, P2 does as many as possible until P1 returns from the run. Continue until 150 Pullups are completed. Then, immediately, start the second portion which is a leap frog format. 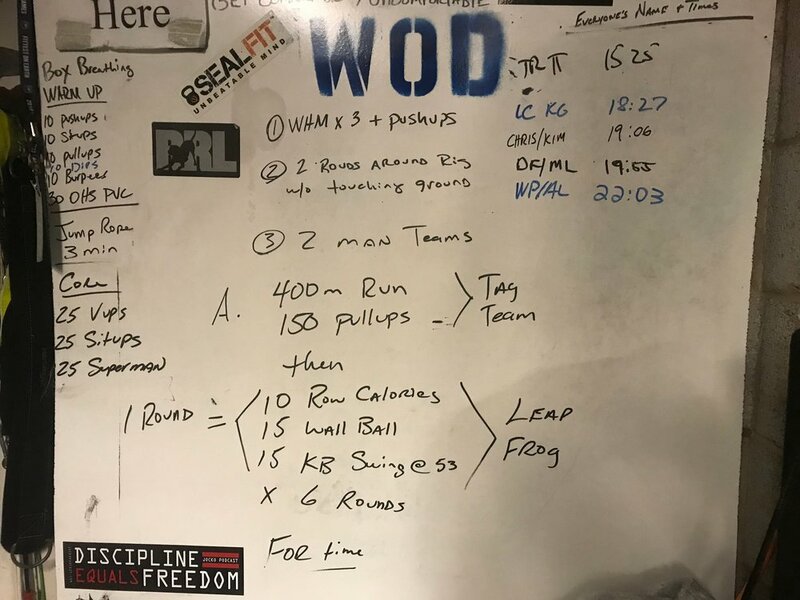 Whichever partner finishes the 150 pullups will then move to the KB Swings and do 15 while the other partner waits at the rower for them to complete 15 reps. The partner calls out when finished and then the other partner starts the row. At this time the guy on KB swings moves to the wall ball station (leap frogging the other partner). When the team has done KB, Row and Wall Balls, that = 1 round. The team completes 6 rounds to finish this workout.